Occupying an enviable cul-de-sac position with superb views is this five bedroom detached executive style family home, worthy of internal inspection and offering substantial family accommodation throughout. This stunning property is appointed to the highest specifications, benefiting from uPVC double glazing & combination gas central heating, three reception areas as well as the converted garage into a music room and bar, double driveway providing off road parking and attractive landscaped garden to the rear. 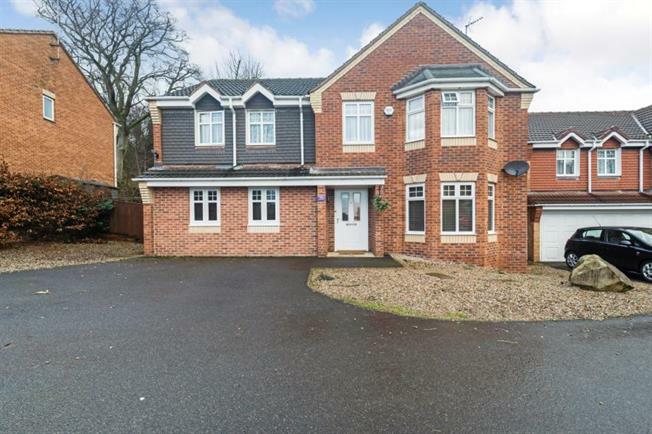 Located in a sought after residential development ideally placed for local facilities, schools & links to the city centre & motorway network links. Stylishly presented throughout and newly carpeted the accommodation in brief comprises: reception hall with ground floor wc and stairs rising to the first floor landing, rear facing lounge with French style doors accessing the rear garden and a wall mounted contemporary Bio Ethonal Fire, and double doors lead into the bay fronted dining room. Stunning breakfast kitchen with an attractive range of wall and base units having integrated appliances to include gas hob, electric oven and extractor fan, as well as space and plumbing for a dishwasher and fridge/freezer. The kitchen is also open plan into the garden room overlooking the rear garden. utility room with space and plumbing for an automatic washing machine and base unit providing further storage. A music room and bar is accessed via the kitchen area and can be a fantastic room for a variety of uses. First floor landing: Five first floor bedrooms, four of which are double rooms (2 en suite) & family bathroom. The master bedroom boasts a walk in dressing room, built in storage and wardrobes with access to the en suite shower room, double bedroom two also benefits from built in wardrobes and en suite shower room. The family bathroom is well proportioned and benefits of a contemporary three piece suite in white comprising of wash hand basin in vanity unit, low flush wc and P shaped bath with mains shower with Drench head and shower screen above. Externally: To the front of the property is a double drive. Whilst to the rear of the property is a split level landscaped garden, being lawned with stocked borders and flagged patio areas, along with a garden shed. Mosborough Village is highly sought after and is popular with buyers of all ages, known for its excellent amenities on the High street, local schools and popular Mosborough Hall. There is a host of gastro style restaurants nearby and Crystal Peaks Shopping Centre and Drakehouse Retail Park offer further facilities. Excellent local walks through the Moss Valley and outdoor pursuits at Rother valley Country Park. Mosborough boasts excellent links to both the M1 Motorway networks and Sheffield City Centre.